King Abgarus receiving the Image of Edessa that is said to depict Jesus. According to Christian legend, the Image of Edessa, known to Orthodox Christians as the Holy Mandylion, was a holy relic - a piece of cloth allegedly containing the miraculous image of the face of Jesus imprinted upon it - the so-called first icon ("image"). The original record of this relic was first recorded in the early fourth century C.E. by Eusebius of Caesarea. He said that King Abgar V of Edessa wrote to Jesus, asking him to come cure him of an illness. Abgar, thereafter, received a letter from Jesus, declining the invitation, but promising a future visit by one of his disciples. Along with the letter was sent a likeness of Jesus. Instead, the apostle "Thaddaeus" is said to have come to Edessa, bearing the words of Jesus, by the virtues of which the king was miraculously healed. The first record of the existence of a physical image was in the sixth century, in the ancient city of Edessa (now Urfa). The image was moved to Constantinople in the tenth Century. The cloth disappeared from Constantinople during the Fourth Crusade (Sack of Constantinople) in 1204, reappearing as a relic in King Louis IX of France's Sainte Chapelle in Paris. It finally disappeared in the French Revolution. Since legend has Jesus was living at the time of this imprint, this image would seem to have no connection with his alleged burial cloth, the Shroud of Turin. The story of the Mandylion is the product of centuries of development. The first version is found in Eusebius' History of the Church (1.13.5-1.13.22). Eusebius claimed that he had transcribed and translated the actual letter in the Syriac chancery documents of the king of Edessa. He records a letter written by King Abgar of Edessa to Jesus, asking him to come cure him of an illness. Jesus replies by letter, saying that when he had completed his earthly mission and ascended to heaven, he would send a disciple to heal Abgar (and does so). At this stage, there is no mention of an image of Jesus. The vicissitudes of the Edessa image between the first century and its location in his own time are not reported by Eusebius. The materials, according to the scholar Robert Eisenman, "are very widespread in the Syriac sources with so many multiple developments and divergences that it is hard to believe they could all be based on Eusebius' poor efforts". In 384 C.E., Egeria, a pilgrim from either Gaul or Spain, was given a personal tour by the Bishop of Edessa, who gave her many marvellous accounts of miracles that had saved Edessa from the Persians and put into her hands transcripts of the correspondence of Abgarus and Jesus, with embellishments. Part of her accounts of her travels, in letters to her sisterhood, survive. "She naïvely supposed that this version was more complete than the shorter letter which she had read in a translation at home, presumably one brought back to the Far West by an earlier pilgrim" Her escorted tour, accompanied by a translator, was thorough; the bishop is quoted: "Now let us go to the gate where the messenger Ananias came in with the letter of which I have been telling you." (Palmer). There was however, no mention of any image reported by Egeria, who spent three days inspecting Edessa and the environs. Thus we can trace the development of the legend from a letter, but no image in Eusebius, to an image painted by a court painter in Addai; then to a miracle caused by the letter in Procopius, which becomes a miracle caused by a miraculously-created image supernaturally made when Jesus pressed a cloth to his wet face in Evagrius. The later legend of the image recounts that since the successors of Abgar reverted to paganism, the bishop placed the miraculous image inside a wall, and setting a burning lamp before the image, he sealed them up behind a tile; that the image was later found again, after a vision, on the very night of the Persian invasion, and that not only had it miraculously reproduced itself on the tile, but the same lamp was still burning before it; further, that the bishop of Edessa used a fire into which oil flowing from the image was poured to destroy the Persians. This long-developing legend of a miraculous first image of Jesus that appeared on a cloth he pressed to his wet face, was adopted by the Eastern Orthodox church not as legend, but as historical fact. Countless reproductions of what was considered to be the image were painted as icons; in the nineteenth century they were carried as khorugvs (religious banner) by the Russian armies. According to Robin Cormack, almost every Byzantine church contained a representation of the image by the beginning of the Iconoclastic period. Because the miraculous image of the later legend was believed to be not made by humans but by God, it is called acheiropoietos in Greek—"Not Made by Hands." John of Damascus (died 749) mentions the image in his anti-iconoclastic work On Holy Images, quoting a tradition that Abgarus had requested an image of Jesus and Jesus himself put a cloth to his face to produce the image. The cloth is described as being a "strip," or oblong cloth, rather than a square, as other accounts hold. The image itself is said to have surfaced in 525 C.E., during a flood of the Daisan, a tributary stream of the Euphrates that passed by Edessa. This flood is mentioned in the writings of the court historian Procopius of Caesarea. In the course of the reconstruction work, a cloth bearing the facial features of a man was discovered hidden in the wall above one of the gates of Edessa. By 544 C.E., when Procopius recorded the recovery of Edessa from the Persians, he attributed the event to the letter sent from Jesus to Abgar. In a further elaboration, in 593 C.E., Evagrius attributed the same event to a "God-made image," a miraculous imprint of the face of Jesus upon a cloth. It was this last and latest stage of the legend that became accepted in Eastern Orthodoxy. Evagrius Scholasticus mentions in his Ecclesiastical History the image of Edessa discovered in 544, that was "created by God, and not produced by the hands of man." 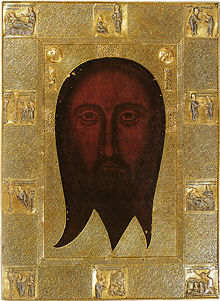 This idea of an icon that was Acheiropoietos (Αχειροποίητος, literally "not-made-by-hand") is a separate enrichment of the original legend: similar legends of supernatural origins have accrued to other Orthodox icons. The Holy Mandylion disappeared again after the Sassanians conquered Edessa in 609. An Arab legend, related to historian Andrew Palmer when he visited Urfa (Edessa) in 1999, relates that the towel or burial cloth (mendil) of Jesus was thrown into a well in what is today the city's Great Mosque. The Christian tradition is at variance with this, recounting how in 944 it was exchanged for a group of Muslim prisoners— at that time the Image of Edessa was taken to Constantinople where it was received amidst great celebration by emperor Romanus I, who deposited it in the chapel of the Great Palace of Constantinople. It remained there until the Crusaders sacked the city in 1204 and carried off many of its treasures to western Europe - though the "Image of Edessa" is not mentioned in this context in any contemporary document. A small part of this relic, or one believed to be the same, was one of the large group sold by Baldwin II of Constantinople to Louis IX of France in 1241 and housed in the Sainte Chapelle in Paris (two documentary inventories: year 1534 (Gerard of St. Quentin de l´Isle/Paris) and year 1740) until it disappeared during the French Revolution (not to be confused with the Sainte Chapelle at Chambery, home for a period of the Shroud of Turin). Journalist Ian Wilson has put forward a theory that the object venerated as the Mandylion from the sixth to the thirteenth centuries was in fact the Shroud of Turin, folded in four, and enclosed in an oblong frame so that only the face was visible. For support, he refers to documents in the Vatican Library and the University of Leiden, Netherlands, which seem to suggest the presence of another image at Edessa. A tenth century codex, Codex Vossianus Latinus Q 69 found by Gino Zaninotto in the Vatican Library contains an eighth-century account saying that an imprint of Christ's whole body was left on a canvas kept in a church in Edessa: it quotes a man called Smera in Constantinople: "King Abgar received a cloth on which one can see not only a face but the whole body" (in Latin: [non tantum] faciei figuram sed totius corporis figuram cernere poteris). This image is apparently not the same as the Mandylion whose widely-disseminated and familiar iconic image is of a face alone. Byzantine reports however mention "one original and two copies." The Holy Face of Genoa. This image is kept in the modest Church of St Bartholomew of The Armenians, Genoa, where it was donated to the city’s fourteenth century Doge Leonardo Montaldo by the Byzantine Emperor John V Palaeologus. It has been the subject of a detailed 1969 study by Colette Dufour Bozzo, who dated the outer frame to the late fourteenth century, while the inner frame and the image itself are believed by some to have originated earlier. Bozzo found that the image was imprinted on a cloth that had been pasted onto a wooden board. This image was kept in Rome’s church of S. Silvestro up to 1870 and is now kept in the Matilda chapel in the Vatican. It is housed in a Baroque frame donated by one Sister Dionora Chiarucci in 1623. The earliest evidence of its existence is 1517, when the nuns were forbidden to exhibit it to avoid competition with the Veronica. ↑ Robert Eisenman(1998). James the Brother of Jesus: The Key to Unlocking the Secrets of Early Christianity and the Dead Sea Scrolls. (Penguin. ISBN 014025773X), 862. ↑ Andrew Palmer, 1998. Andrew Palmer's essay on Edessa in Golden Horn: a Journal of Byzantium. Retrieved January 17, 2009. ↑ St. John of Damascene on Holy Images (Followed by Three Sermons on the Assumption). Christian Classics Ethereal Library. Retrieved January 17, 2009. ↑ Grove Dictionary of Art Retrieved January 17, 2009., also Steven Runciman, Some Remarks on the Image of Edessa, Cambridge Historical Journal 1931. Retrieved January 17, 2009. ↑ Ian Wilson. Holy Faces, Secret Places: The Quest for Jesus' True Likeness'. (London: Doubleday, 1991). ↑ From the library of Gerhard Johann Vossius. ↑ Codex Vossianus Latinus, Q69, and Vatican Library, Codex 5696, fol.35, which was published in Pietro Savio. Ricerche storiche sulla Santa Sindone (Turin: 1957). All links retrieved February 25 2018. Eyewitness report: The sermon of Gregory Referendarius in 944. History of "Image of Edessa"
This page was last modified on 26 February 2018, at 00:20.